We hope that a larger window for collecting information will enable more schools to participate -- and the more schools we have participate, the more valuable the data in the report will be. Please keep in mind that your school’s report will not be generated until the surveys have closed, so that the dataset is the most complete it can be. Reports based on assessments completed by March 1 will be generated prior to the ATLIS Annual Conference in April. Please note changes in the assessment for younger students. Though there is no longer a Young Student Survey, schools are encouraged to include students grades 3 and up. The survey questions are written at a 5th-grade reading level, and our research has found that independent school students as young as grade 3 are able to understand them. Also, because no personally identifiable information is captured, there is no compliance issue with COPPA. Here are a checklist and some tools to help you prepare. Simply deploy the surveys listed below to the respective groups. Reports will be sent shortly before the ATLIS conference in mid April. All ATLIS member schools are invited to participate in the Technology Impact and Efficacy (TIE) Assessment. This service is offered to members schools as a benefit included in your ATLIS membership. We've created a sample report designed to mimic the confidential report each school receives for perusal. 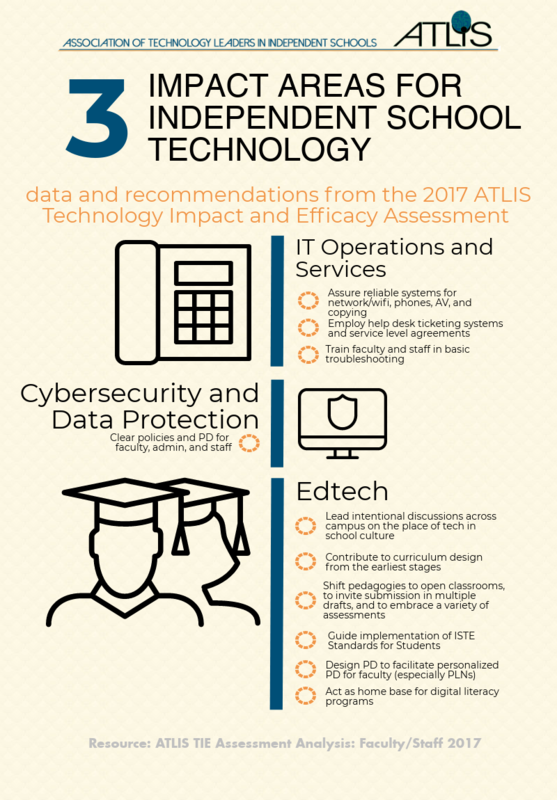 The purpose of the TIE Assessment is to help schools understand the impact technology has on academics, operations, and data security as well as provide member schools with a dashboard report indicating their strength in these areas relative to the ATLIS member school norms. No school will able to access school-level data about any other school. Individual school reports will include suggested areas to target for growth. These suggested areas are selected from those that will have the greatest effect on improving the impact technology has on the school program. In order to offer this level of report and recommendations, we need to collect quality data from our members. We need information from most students in a school and all faculty and staff. This data is efficiently gathered via four data collection tools. Sarah Hanawald and Alex Inman discuss the findings of the TIE survey--including some surprises revealed along the way.